Are you asking me why you should wear a smile today? Well, for the simple reason that you are up and kicking… That should motivate you and keep you happy. Shouldn’t it? Much ado about a simple smile, right? So how about that? 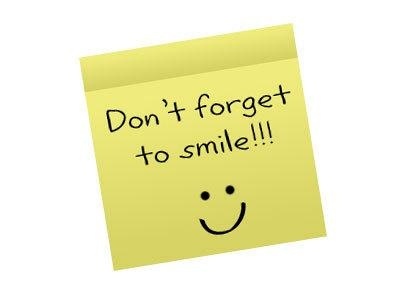 How about starting your day by wishing yourself well, with a warm smile on your face? That you woke up by yourself and in good and excellent health. Isn’t that a miracle? I know. Yes, I know. It is true that you may have an empty bank account now. Or just a few coins in there… But should you worry yourself to death? No. No, you shouldn’t do that to yourself. That’s enough reason to make you smile because you can still excel in life, if you continue to pursue excellence in your career goals. Give thanks for your life and go ahead and give yourself the best of smiles! Remember this today. Ninety percent of today’s successful people started with nothing! Today is a new day for personal development. Decide today to be extraordinary! Decide to get to the top of your dreams. Decide to be phenomenal. Take a drastic action today and decide to excel. simpledimple • This entry was posted in Articles, Blog, Motivational and tagged Blogging, Careers and Goals, Daily Nuggets, Daily Post, Daily Prompt, Humanity, Inspirational, Lifestyle, motivational, Positive vibes, Postaday, Prose-Poem, Smile, WordPress. Bookmark the permalink. Absolutely true and agree totally with these awesome words of inspiration, Stella. Smile and make others smile too. Thanks for the smiling share. Pingback: Wonderful Wednesday-Life’s A Story Made Up of Lots of Memorable Moments! « Simply Etta D.